Hi! 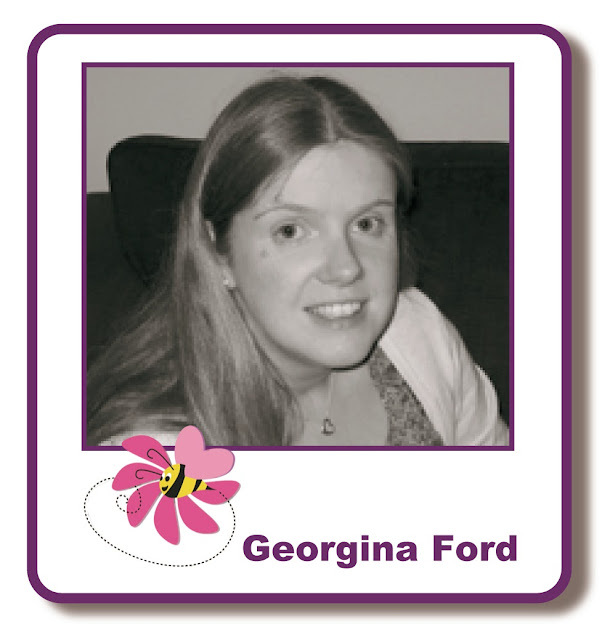 It's Georgina with my Thursday post. This is my second post as part of the Card-io promotion and giveaway. I have a tag and cards to share with you using Card-io stamps and Anna Marie Designs card. The Card-io stamps I used were Lots of Pots, Say it with flowers and Mum's Garden. The dottie card is Anna Marie Designs aquamarine Dottie card. The coloured ink pads I used were VersaColor ink pads in Atlantic, Heliotrope, Ash Rose and Sky Blue. All these are all available from Lisa B Designs. To make the tag I started by cutting a tag from aquamarine Dottie card. I punched a hole in the top to thread the ribbon through. On a strip of white card I stamped the sentiment and jar using Tuxedo Black Memento ink pad. I then stamped the flowerheads and drew in green lines with a Forest Moss Distress Marker for the stems. I cut out the top of the strip around the flowerheads. I stamped the butterflies directly onto the tag with the Memento ink. To finish I added faux stitching and Platinum Stickles to the centre of the flowers. For my next two card I cut pieces 21x10.5cm of aquamarine Dottie card and scored in half to form the card blanks. 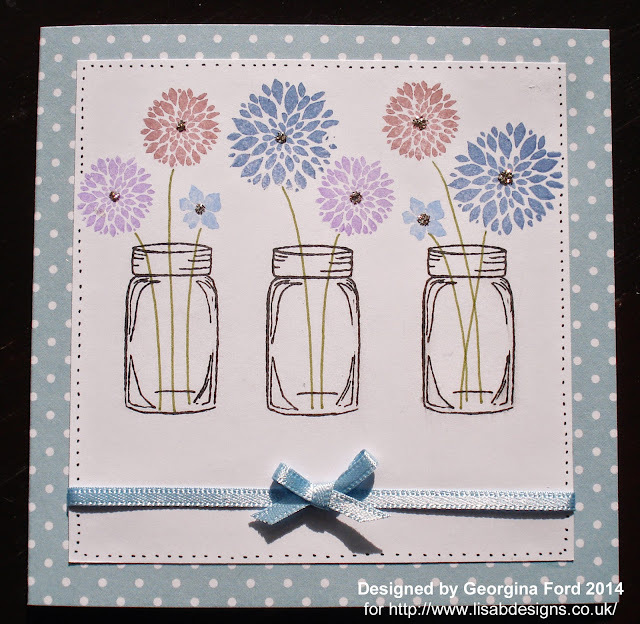 For my first card I stamped the jar and flower design onto a strip of white card which I then attached to the card blank. 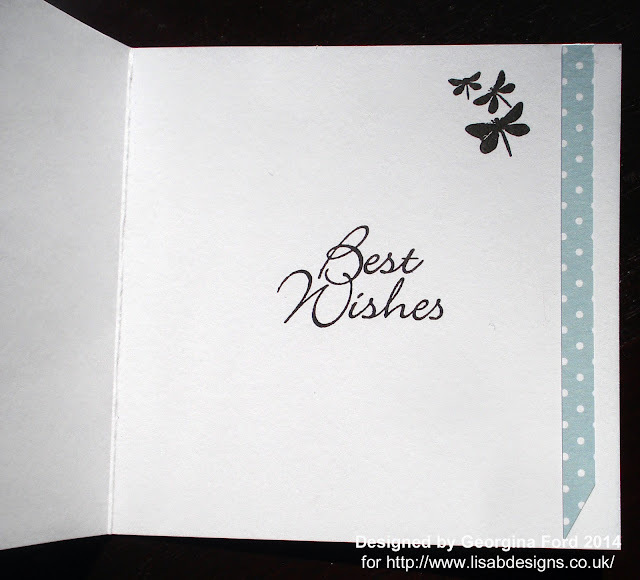 I also stamped the sentiment and butterflies onto the card blank with a Memento ink pad. I added a strip of dottie card inside the card. I stamped a sentiment and butterflies inside the card. 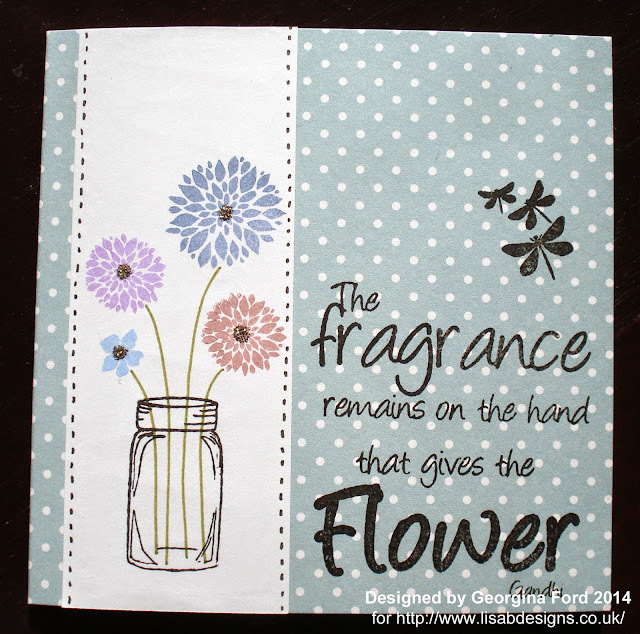 The sentiment stamp is Hobby Art's Birthday Collection. To finish the card I added black dots and Platinum Stickles. For my final card for today. I cut a square of white card which I stamped the jar and flowerheads onto. I added a piece of light blue ribbon across the square before adding to the card blank. I also added a bow tied from the same ribbon. Inside the card I attached squares of dottie and white card. 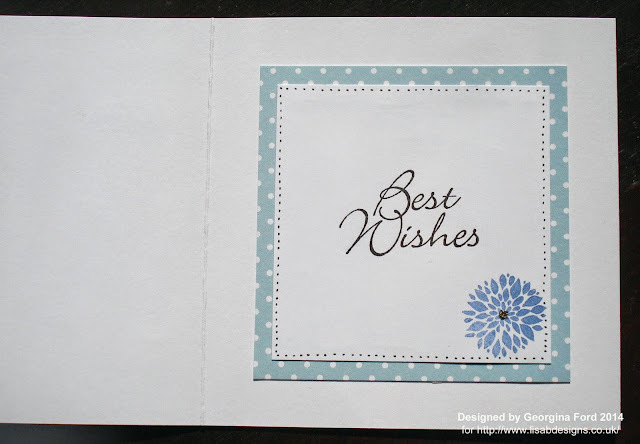 I stamped the large flowerhead on the corner and a sentiment in the centre. To finish the card I added black dots and Platinum Stickles. For more details about the Giveway, pop over to this blog post. To be entered in the giveaway, you must leave a comment on EVERY Card-io promotion blog post April 7 to the final post on April 19. Such a gorgeous set. 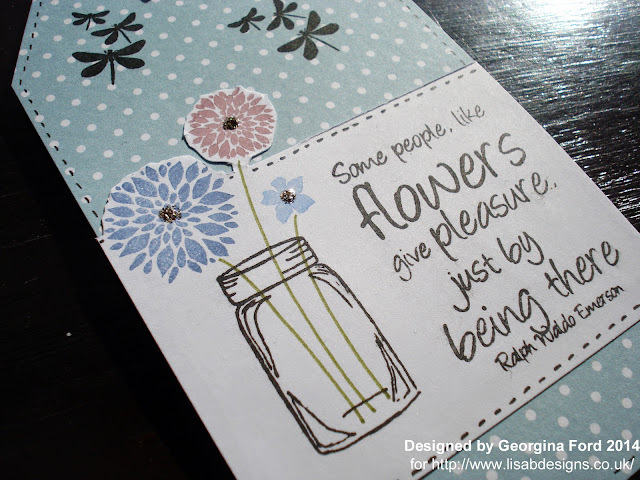 I love the pretty and delicate designs with that beautiful spotty paper and wonderful sentiments too. Really pretty cards and tag. Three different looks from a great stamp set. Love the colour palette of these cards. Well done.